This workshop will provide an introduction to the R packages networkDynamic, ndtv and tsna. These tools can be used for both empirical and simulated network data.We will illustrate both, with some well-known data sets from the social network literature, and some simulations from the statnet package tergm. The workshop will demonstrate how to import, transform and extract relational data with timing information from various data structures (matrices, spell lists, toggles, etc.). We will discuss advantages of various temporal models and representations as well as considerations about how to slice and aggregate time in networks. Attendees will learn to create visualizations of network dynamics, including exporting network animations as videos or interactive HTML5 web pages. 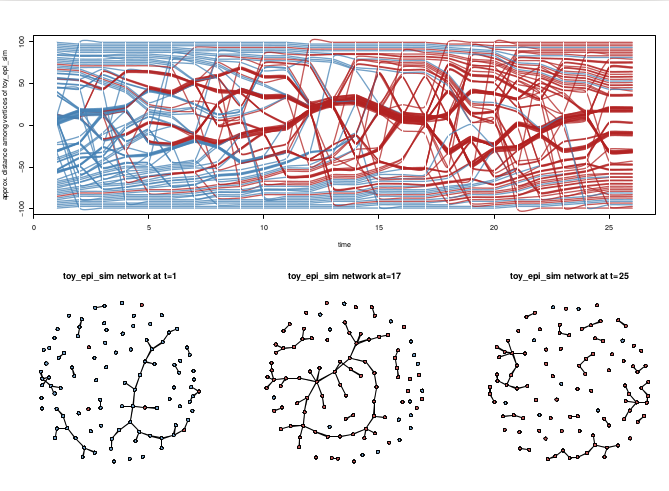 We will also discuss some common visualization challenges, such as adjustments needed when working with networks with disconnected components, and how to determine if a network has appropriate size and density to create an animation. Some non-animation techniques such as relationship timelines, filmstrips and other projections will be explained as well. Finally we will demonstrate some of the basic functionality for calculating temporal network statistics using the tsna package, including computing temporal paths, and basic sequence measures. Familiarity with R. Previous experience with the statnet packages (ergm, tergm, network and networkDynamic) is helpful but not required.